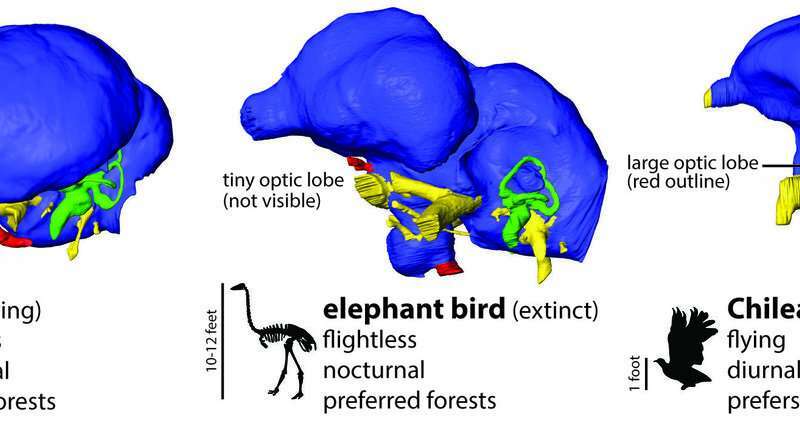 A digital brain reconstruction of the recently extinct elephant bird revealed that its optic lobes were virtually absent, a trait it shares with the closely-related kiwi and which indicates that it was nocturnal and possibly blind. This is in contrast to the distantly related tinamous, which is active during the day and can see. Credit: C. Torres for The University of Texas at Austin. 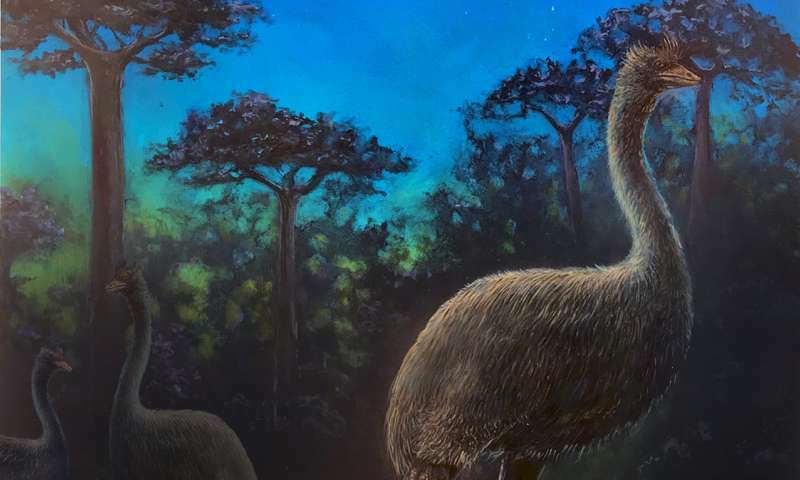 A nocturnal lifestyle is a trait shared by the elephant bird's closest living relative, the kiwi—a practically blind, chicken-size denizen of New Zealand—and a clue that is helping scientists learn more about the elephant bird's behavior and habitat, said Christopher Torres, a Ph.D. candidate who led the research. "Studying brain shape is a really useful way of connecting ecology—the relationship between the bird and the environment—and anatomy," Torres said. "Discoveries like these give us tremendous insights into the lives of these bizarre and poorly understood birds." Julia Clarke, a professor at the UT Jackson School of Geosciences and Torres' Ph.D. adviser, co-authored the study. Torres is a student in UT's Department of Integrative Biology in the College of Natural Sciences. "Humans lived alongside, and even hunted, elephant birds for thousands of years," Torres said. "But we still know practically nothing about their lives. We don't even really know exactly when or why they went extinct." Giant nocturnal elephant birds are shown foraging in the ancient forests of Madagascar at night. Credit: John Maisano for the University of Texas at Austin Jackson School of Geosciences. Scientists had previously assumed that elephant birds were similar to other big, flightless birds, like emus and ostriches—both of which are active during the day and have good eyesight. But Torres and Clarke revealed that elephant birds had distinctly different lifestyles through reconstructions of their brains. In both elephant bird skulls, the optic lobe—a bundle of brain nerves that controls eyesight—was very small, with the structure almost absent in the larger species. The lobe had the most in common with that of a kiwi, which Torres said came as a "total shock" because of the kiwi's poor vision and nocturnal behavior. "No one has ever suspected that elephant birds were nocturnal," Torres said. "The few studies that speculated on what their behavior was like explicitly assumed they were active during the day." "I was surprised that the visual system is so small in a bird this big," he said. "For a bird this large to evolve a nocturnal lifestyle is truly bizarre and speaks to an ecology unlike that of their closest relatives or any other bird species that we know of." In addition to vision, the endocasts rendering of the olfactory bulb—the part of the brain that processes the sense of smell—helped shed light on the habitats where elephant birds lived. The larger of the two species of elephant bird had a large olfactory bulb, a trait associated with forest dwelling. In contrast, the smaller elephant bird species had a smaller olfactory bulb, possibly indicating that it lived in grasslands. The smaller species also appears to have somewhat keener vision, which means it may have been more active at dusk than during the pitch black of night. "Details like these not only tell us about what the lives of elephant birds were like, but also what life in general was like on Madagascar in the distant past," Clarke said. "As recently as 500 years ago, very nearly blind, giant flightless birds were crashing around the forests of Madagascar in the dark. No one ever expected that." IIRC, the kiwi and its ilk were probably nocturnal to avoid daytime predation by the huge Haast's Eagle. Was there a similar raptor on Madagascar ?